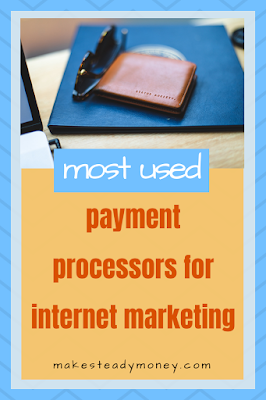 One of the biggest challenges of internet marketing or working from home opportunities is to find the right payment processors for withdrawing your hard earned money. Since the rejections of many online earning opportunities by Paypal in 2015 and the fall of Payza in mid-2018, All programs have their own, wide range, of payment processor options. There doesn't seem to be a standard, overall used payment processor anymore. This results that you need to be signed up at, and manage a lot of these processors. There is a big change you will end up with little amounts of money that got stuck everywhere. To less to withdraw to your bank, or too high fees to merge all your little amounts of money into one payment processor. Luckily, this been picked up by the program admins later in 2018. Most of them have a cryptocurrency option or work with Solidtrustpay now as there standardized payments processors. With the payments processor that I have carefully compared on common use in a wide range of programs below, you will be able to work and get paid in all work from home and internet marketing programs. All are free to sign-up at, without any maintaining costings or monthly subscription fees. You will only pay a small fee when you use them to transfer or withdraw money. Since it takes a while to get them verified to your bank and personality, I highly recommend you to sign up at all of them. Once verified, these 5 payments processors together will be covering all your needs to withdraw your money with a minimum of managing and shifting around of your money. As said, next to cryptocurrency is Solidtrustpay now one of the most common used wallets in internet marketing and work from home opportunities. Direct withdraw and deposit from your bank account is possible from $ 10.00. Many currencies are accepted including Bitcoin. STP Has its own credit card option for ATM use. My absolute most favorite alternative after the close down of Payza and where Paypal is not supported. STP is used by almost all viral safelist mailer and traffic exchange owners. If you are into traffic programs, Solidtrustpay is an essential E-wallet to have. Especially in micro earning sites like Paid to click, surveys etc is Skrill a payment processor that is used more and more by the owners of the program to make their payouts. Skrill is accepted in over 200 countries and you can withdraw your money to your bank account with a minimum of $ 10.00. Skrill has its own bank card for ATM use as well. Payoneer can be connected with a wide range of affiliate and advertising networks. With this online wallet, you will have an extra bank account number to make and receive payments overseas where your current bank account is not supported. Any payment from any bank can be directly received. Direct deposit from your bank account and a min withdraw of 50 dollars to your bank account. Has its own MasterCard option as well. Quite high fees comparing to Solidtrustpay. One of the most known and trusted online wallet for the big cryptocurrencies. You can deposit and withdraw cryptocurrency, like Bitcoin, Litecoin or Etherium, directly to your bank account when connected. Coinbase makes working with cryptocurrency almost as native as working with Paypal for fiat currency. A Cryptocurrency E-wallet that can hold and convert a wide range of coins (over 800 now) for a low transfer fee. Since it can hold almost any crypto coin, it's very suitable as a "household wallet" for all your daily online crypto payments or to convert your alt-coins to Bitcoin, the mother of all crypto coins. To withdraw or deposit from fiat money you will need a crypto exchange broker like Coindeal or convert your coins to one of the biggest coins and transfer them to Coinbase. With Coinbase you can withdraw or deposit crypto money in fiat money to your bank account directly. Coinpayments, for your daily payments and holding a wide range of crypto coins, and Coinbase, to exchange crypto to or from your bank account in fiat money is a matching, good working, combination. All processors need to be verified with your personal ID and residual address for full usage. Since this process takes a few working days, it is wise to start the verification process right after you have signed up at them. All E-Wallets above are stable, well known and trusted ones. Still, There where a few other that has issues in the past and even got down or frozen user accounts. For your safety, don't keep more money in them that you need to work with. Hope this article was useful for you. Feel free to share it or leave your questions in the comment section below.